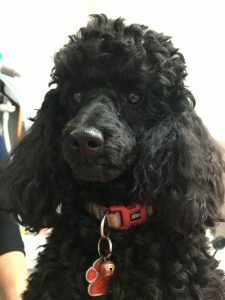 Delta is a lovely little poodle acquired by one of our staff. At her first visit, our vets noted she had an “overbite”. Technically speaking we would call this a class III malocclusion where there is a relative elongation of the lower jaw. As both human and animal dentistry have advanced, we now know that this is a concern for Delta as she has teeth that are colliding with each other. Her lower third canine teeth are in contact with her upper second and third incisors. Any time we have tooth-on-tooth or tooth-on-gum contact we need to consider treatment to avoid long term pain and discomfort and associated behavioural problems. Often, the earlier we act the better. Children receive orthodontics younger now and this is the same scenario. Earlier intervention can help as the mouth is still growing. In Delta’s case, she had both lower canines removed and all her upper incisors too. Why? Because once we had the canines out of the way (removing the tooth-on-tooth problem), the upper incisors (front teeth) would have tooth on gum contact (on the inside of the mouth behind the lower front teeth). Other more complex solutions could also have been used such as capping the canines or inserting a plate. For many owners, that number of teeth being removed is worrying but it’s really not a problem. Many dogs are much happier not having the pain and discomfort and they cope very well with less teeth. The other common worry is the anaesthetic, especially when it comes to young and old pets. With dental issues, sometimes we need to get teeth out at a very young age- younger than 6 months. Here at the Uni Vets Camden we have dedicated anaesthetists who are vets with years of additional training in anaesthesia. For an additional fee, you can elect to have them manage you pet’s anaesthetic if that is an area of concern for you. Finally, we are lucky in Sydney to have some excellent vets who are extremely knowledgeable and capable when it comes to pet dentistry. 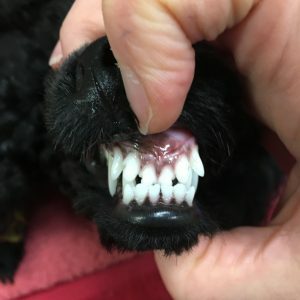 In Delta’s case, while we could have done the extractions here, Delta was referred to Dr Christine Hawke at Sydney Pet Dentistry so Delta’s owner could decide the best option for them.